Pour water and spice packs from ramen noodles into the dutch oven. Heat dutch oven to about 250 degrees on coals for Simmering. Bring to a boil, and then add the fish cubes. Keep a low boil for 10 minutes. 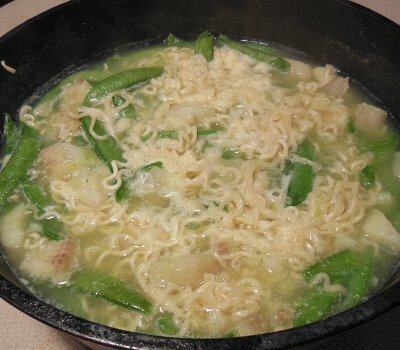 Break ramen noodle bricks into smaller chunks and add them to dutch oven. Heat for about 5 minutes, while occasionally giving a soft stir. Cook until the noodles are soft and unraveled. Softly stir in frozen peas and carrots. Heat for another 5 to 10 minutes. Let me know how you enjoyed your Peter's Fish Soup!